Our Expectations: The Common Burger. An eight ounce Pat LaFrieda blended patty with cheddar, tomato, rockets, sautéed onions, and herbed aioli served on a brioche bun. Differing from many of the ubiquitous burger joints in the city, West 3rd Common chooses to steam their burger rather than using the conventional grilling technique. Verbatim from Chef Walker, “Steaming it makes it super juicy, even when it’s cooked well done.” A steamed burger can perplex our palates now and again, as we’re used to the grilled flavors of beef accompanied by a crusty or glazed outer edge. With a steamed burger, a technique which famously began in Connecticut, the result is often a juicier burger that lacks the cloddishness that can coincide with an eight ounce patty. Still, poor execution can strip the burger of flavor. Given Chef Walker’s culinary background, successful execution is unquestionably an expectation of ours. Meat: We at Burger Bedlam always approach a larger patty with cautiousness. From time to time, we encounter one that is so massive and monstrous that the size has consumed the chef’s efforts to add flavor and maintain juiciness. Fear not, burger enthusiasts, for the steaming technique that Chef Walker implements results in a juicy and flavorful bite. Combining a fresh taste and undeniably rich seasoning, you’re bound to lick your fingers clean and give an attempt to catch the grease that drips down your hands. That, is a quality in which all best burger in NYC contenders should possess. Toppings: Provided the comfort food nature of the menu at West 3rd Common, the toppings which accompany the Common Burger are rather expected. Herbed aioli and sautéed onions make for a pleasing combination, one we can truly get behind. Sans ketchup, the toppings add a nice punch to our pallets, but not enough to overtake the beef as the winner in the taste category. They were complementary and done well, with the cheddar draped nicely and all the rest being a more standard and traditional accoutrement. Bun: Soft brioche, with fine coverage of the patty which also withstood the juiciness of the steamed results. Not as sweet as we would’ve liked, but it did its job admirably. Toppings (21): Not overly done or contrived, the toppings added plenty of value to the taste of every bite. The aioli was well received and sautéed onions were sweet but not soggy. Bun (20): Great proportional size, held up to the juiciness and tasted fresh. No complaints. UPDATE: *Beacon has now shuttered. Few notable restaurants in Midtown Manhattan cater to burger loving New Yorkers, and even fewer have a reputation of serving up one of the best burgers in NYC. 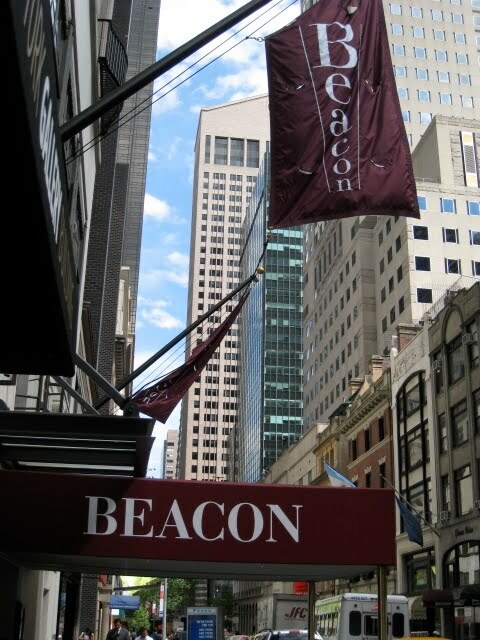 That’s what makes Beacon Restaurant & Bar a standout in the bustling area of Gotham. Featuring a “quick and casual” Burger Bar, compliments of Chef Waldy Malouf, Beacon has earned rave reviews for a handful of years for their eight ounce entrée of beef. Largely a favorite of food critics (Robin Raisfeld of NY Mag here and eGullet.com co-founder Stephen A. Shaw here), The Beacon Burger was an obvious choice for one of our reviews. Given that we also work in the area, taking an easy stroll to the establishment during our lunch hour was a pleasure in itself. The demand for the six seats at the bar tends to be high at lunch time, and, unfortunately, we were with a large group during our visit so the full experience of the Burger Bar wasn’t happening this time around. Yet, as compelled as we are to try every “experience” at our burger destinations, we come for one thing, the contending burger. It may be kitsch and happening at the bar, but the menu (as confirmed by the maitre d’) is the same at both bar and dining table. We vow to make it back for the real thing, but we take solace in the fact that we’re trying and reviewing the same burger. 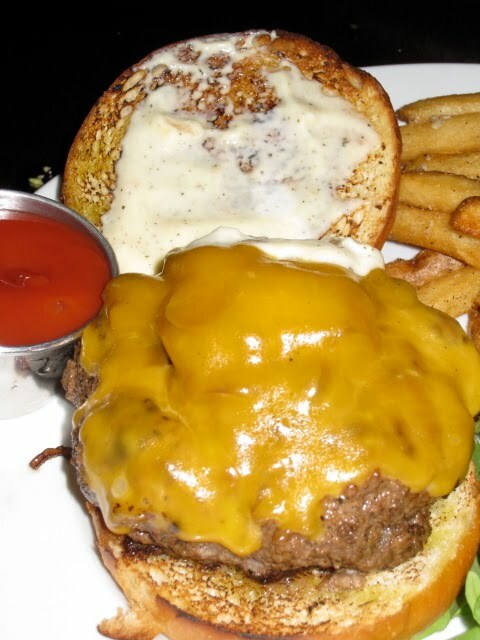 Our Expectations: The Beacon Burger. An eight ounce Niman Ranch Certified Natural Black Angus patty, grilled red onion, lettuce, tomato all on a soft onion roll. Cheese is $0.95 more, but worth it for added flavor so long as you can still taste the meat. With that, we expected to add some Cheddar. If you’re familiar with this burger and have read prior reviews in addition to the links we provided above, you might be wondering, “What happened to the country toast on which this burger was once served?” Well, some time ago, Beacon switched the toast for a soft onion roll. We had hoped to give the new variation of a burger served on country toast a try, but onion rolls seemingly provide a more competent complement of taste to a burger. Country toast often dries out and break down during your burger consumption. As for the meat, Niman Ranch is a very reputable name and with “beef, raised traditionally, humanely and sustainably with no hormones or antibiotics on family-owned ranches,” we were anticipating a tasty patty. Meat: Undoubtedly, we anticipated a stellar combination of freshness and flavor with considerable mention of the Niman Ranch meat sourcing. Though the meat was fresh and juicy, the taste was lacking. Bereft of adequate seasoning, the burger’s taste was mediocre. We give kudos for the presentation, a slice down the middle of the burger to make eating easier, something we enjoy about the Lure Bash Burger as well. 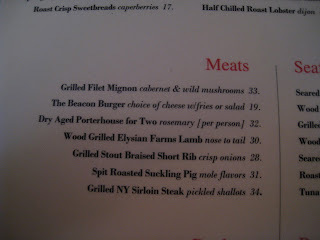 Such a decision makes for clear notice of the cooking temperature, which was disappointingly done at Beacon. 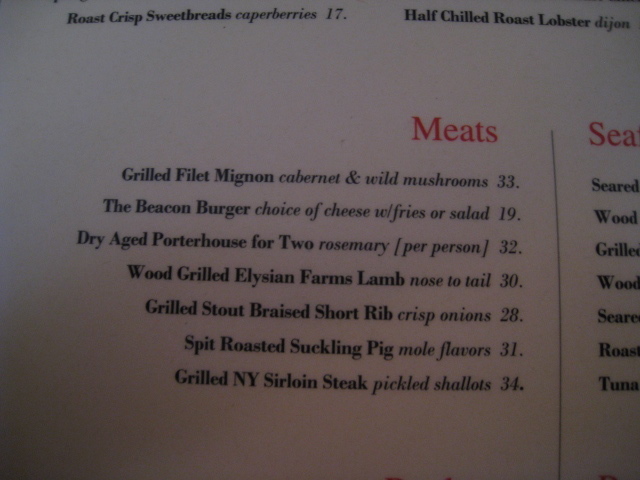 The inside was notably medium rare which we like, but the outside was overcooked and almost charred. We can’t let such mishaps slide. What makes for great eating is a consistently cooked burger throughout the patty, something Beacon’s burger lacked. Toppings: No frills on The Beacon Burger, it comes with what you might consider the standard accoutrements. Our grilled onions were just OK, slightly sweet and not soggy, but there were sparse. The Cheddar was layered and draped but got lost in most bites as it was a thin slice of cheese. Hard to make a case for any of the toppings – all small portions and lacking significant flavor. Bun: Curiously, Beacon threw us a curveball with the onion roll. We read many accounts of the Beacon Burger coming on two pieces of country toast, yet the onion roll graced our plates. Nevertheless, it’s hard to argue that the country toast could’ve served us better than the onion roll. We enjoyed the slightly sweet and significantly fluffy roll, it made up for plenty of the burger’s misgivings. Glazed with a nice buttery croissant-esque coat, it was well received and soaked up plenty of the burger’s juice while providing a slight crunch from it's toasting. Meat (38): Flavor and seasoning were missing. The fresh meat could’ve provided more star power but failed to deliver on our taste buds. A good sized patty but with inconsistent cooking. Toppings (17): A burger purest may like such minimalism, yet the beef needed to carry more weight if the toppings were to be served as such. Small flavor points from the toppings, which were lost in the eating experience. Bun (22): Top billing in the burger experience, the bun became the most noteworthy item. A wise choice for the juicy burger that added some flavor and texture, we’re happy it wasn’t the possibly dry and weak country toast.